My choice of period mostly depends on what I have read most recently. This time I have decided to go Napoleonic, as I am thoroughly enjoying rereading Elting’s Swords Around a Throne. This period is also a reliable choice for most other players. Sam Mustafa’s Blücher rules have proved a good set for our multi player games, being easy to learn yet still quite subtle in play. Sam Mustafa seems to have rejected the constraints of fixed ground and time scales but I still want them for scenario planning. Fortunately his previous grand tactical set, Grande Armée, was less wishy washy on these issues so when Blücher is unclear I refer back to them. Since this is a small scale battle I settled for 1BW to equate to 150 yards. For time, I decided one hour would be represented by 4 game turns each. This is important for planning the arrival of reinforcements. The playing surface came out as follows on an 8×4 table, with 1BW of 150 yards being 3”. The Allies deploy at the top of the table and the French reinforcements arrive at the bottom. The grid is read as lettered columns and numbered rows (thus, Fontenelle is in box G1). The darker areas to the left are lower than their surroundings although the only time this matters is when units cross the contour line. 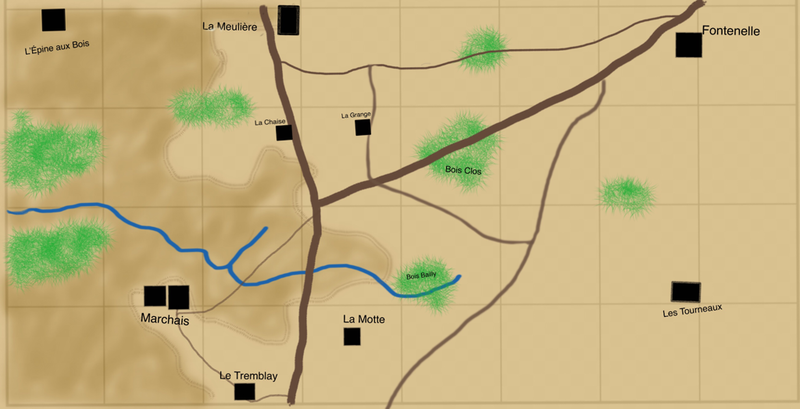 Creating a reliable OOB is difficult at the best of times but even more so for 1814, when some Allied strengths had fallen drastically and bookkeeping for all armies, but especially the hastily assembled French forces, was sketchy. Accounts differ radically but I decided to trust the Batailles website as this seems very well sourced and argued. It also, to be frank, produces a game OOB that seems nicely balanced, which is important for player satisfaction. I accepted the seemingly majority view that there was no Young Guard at the battle. Marshal Ney, commander of the Young Guard, was present on his own and led 8 division with distinction, but his guardsmen were several kilometres short of the battlefield.